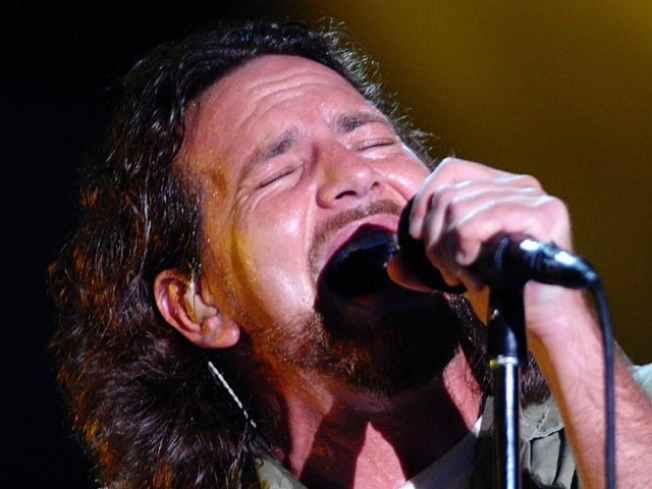 Eddie Vedder of Pearl Jam performs at the 2008 Bonnaroo Music and Arts Festival. Fans came to Gibson Amphitheater for a Pearl Jam concert. They stayed for a grunge reunion with Chris Cornell and Jerry Cantrell. Skeptics will note that not only did Cornell hit the high notes, he probably could have hit them even harder. That was pretty dang awesome. Unfortunately, no one has yet produced video of Alice in Chains' Jerry Cantrell hopping on stage to close out the night with the guitar solo on "Alive," and perhaps that’s just as well: Suddenly unoccupied, PJ guitarist Mike McCready gallivant about the stage like the grunge fairy, flinging handfuls of picks to the admittedly floored crowd throughout the singalong number, and eventually ending up shirtless. Cantrell, for the record, effing killed the lick. So let this be a lesson to all the Pearl Jam fans out there: Always buy tickets for all four shows.